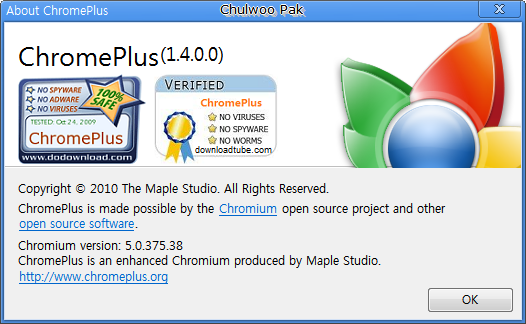 내가 현재 기본 웹 브라우저로 사용 중인 프로그램은 ChromePlus 이다. 최근까지 Maxthon Browser 를 사용하다 업그레이드도 더디고 기타 사소한 불편함때문에 일단은 바꿔서 사용 중이다. ChromePlus(크롬플러스)는 인터넷 익스플로러와 크롬(정확하게는 크로뮴[Chromium])을 동시에 사용할 수 있는 다중 브라우저로 조금 미흡한 점을 있지만, 계속 진화 중이어서 기대가 된다. 4월 20일에 ChromePlus 1.3.9.0 버전이 나온 후 업데이트가 뜸하다가, 네 차례의 알파 테스트 (1.3.10.0)를 거친 후 6월 21일에 1.4.0.0 버전이 새로 나왔다. 이번 버전에서 바뀐 점은 아래와 같다. New feature: Auto-switch of some IE specific pages. New feature: Support other language versions for Francais, German, Hungarian, Korean, Polish, Romanian, Spanish, Ukrainian, Russian and traditional Chinese. New feature: New option for opening links in background mode. New feature: Added a new option for choosing download tool. New feature: New mouse gesture for closing current tab and acitve the left one, and make the "down-left" action as this one by default, make the "right-down" action as "toggle full screen". New feature: Install package will add some info to register so that chromeplus can be removed from the control panel. New feature: Import history,bookmarks,search engines and saved passwords data from Google Chrome. New feature: Added an option to close the tab-thumbnail of Windows 7. New feature: Added the Prompt-bubble for restorable window. New feature: Restored the view of first run bubble. New feature: Added "help" link for some configration options. New feature: Close pop-up windows directly without opening it. New feature: Right click tab to close the page. Bug fix: Drag text in textbox triggered super-drag-search. Bug fix: "Find" box sometimes can not be shown correctly when current page is in IE mode. Bug fix: Auto show/hide bookmark bar without webpage floating up or down. Bug fix: Wrong title when switching from Dom to IEURL to Chrome. Bug fix: Adblock module makes pictures or videos can't be displayed correctly in some websites. Bug fix: Bookmark bar can not be hidden in IE mode. Bug fix: Tab contents are not shown correctly when reopen the pages that were open last. Bug fix: Cache can not be cleared completely when browser exit. Bug fix: Screen freezed sometimes when switching to IE mode. 이번 버전의 기본 크로뮴 버전은 5.0.375.38이다. 현재 배포 중인 크로뮴의 실제 버전에 비해서는 상당히 뒤쳐진 버전이다.